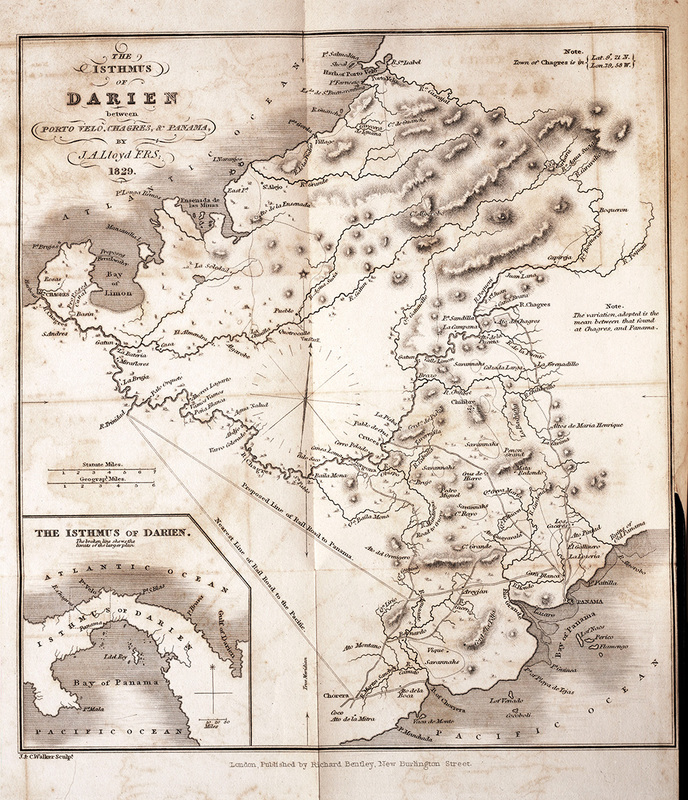 Map of the Isthmus of Darien, or Panama, showing early proposals for railroad routes across the isthmus. From W. Webster, Narrative of a voyage … under the command of the late Captain Henry Foster. London, 1834. Traveling from the Atlantic across the Isthmus before the railroad was built meant going by canoe up the treacherous Chagres River to the town of Cruces. Travelers could then go 20 miles by mule on a road down to Panama on the Pacific side. The return trip was just the reverse, and just as treacherous. Captain Henry Foster made the trip on a surveying voyage in 1831, but fell out of the canoe and drowned before making it back to his ship on the Atlantic coast. 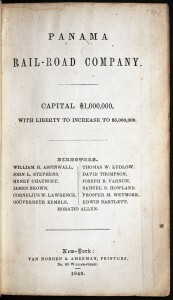 The official narrative of that voyage proposed two possible routes for a railroad. Railroad technology was developing quickly in the 19th century, and a railroad across the Isthmus seemed more realistic than a canal through jungle and mountains. And a lot safer than a canoe! 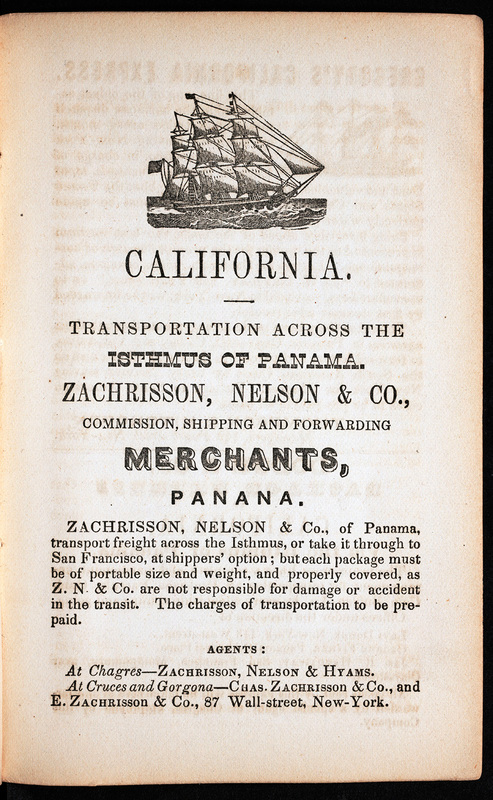 Directors of the Panama Railroad issued this proposal for the railroad with confidence after gold was discovered in California in 1848. 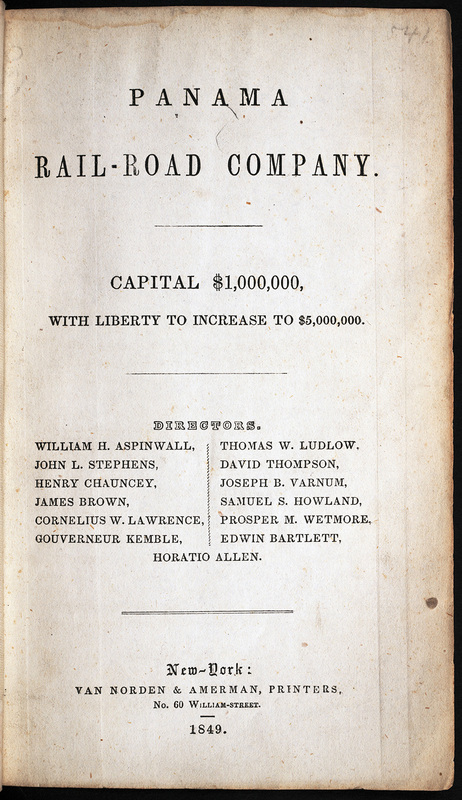 From Pamana Rail-Road Co., Capital $1,000,000. New York, 1849. 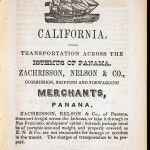 The Panama Railroad was first proposed in December 1847. It was needed, the argument went, for military transport and, William Aspinwall hoped and speculated, for developing a vast trading empire in the Pacific basin. One year later, everything had changed. Gold was discovered in California in 1848, and this new railroad proposal emphasized that “tens of thousands” of U.S. citizens were on their way to California with visions of gold dancing before them. To avoid hardships presented by crossing the Rocky Mountains, throngs sought an easier route by way of the Isthmus. With such a steady stream of eager passengers and associated freight, the prospect of a railroad across the Isthmus seemed like a guaranteed gold mine of a different sort. 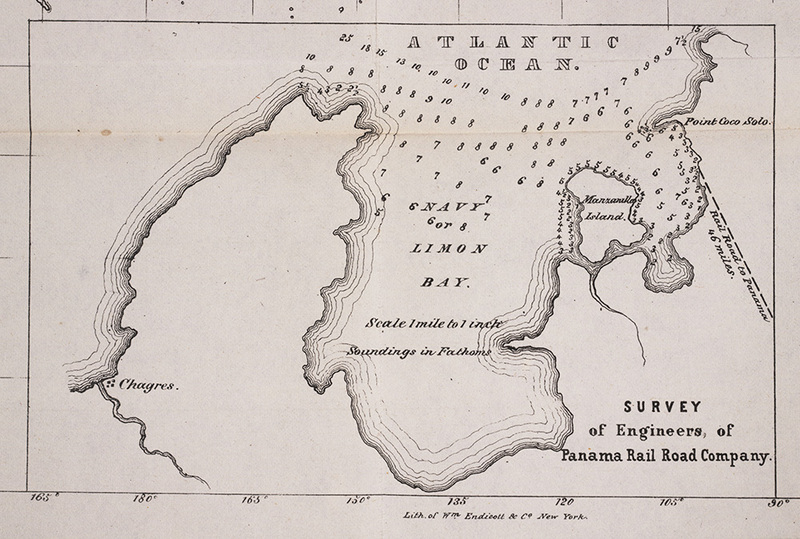 Survey of Limon Bay by engineers of the Panama Railroad, 1848. From from Chart, prepared by Lieutenant M.F. Maury, U.S.N. … on Steam Communication with China and the Sandwich Islands. May 4th, 1848. 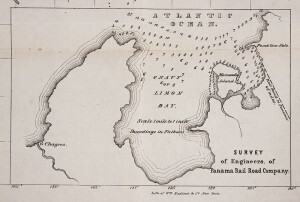 An original survey for the Atlantic end of the Panama Railroad showed the terminus of the line at the eastern edge of Limon Bay. When construction began, however, Manzanillo Island was chosen as the site for the beginning of the railroad. The town of Aspinwall was built at the edge of the small island, which was less than a mile in circumference and barely above tide level. 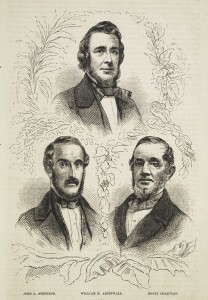 Founders of the Panama Railroad, John L. Stephens, William H. Aspinwall, and Henry Chauncey. From Harper’s New Monthly Magazine, vol. 18, no. 103, January 1859. 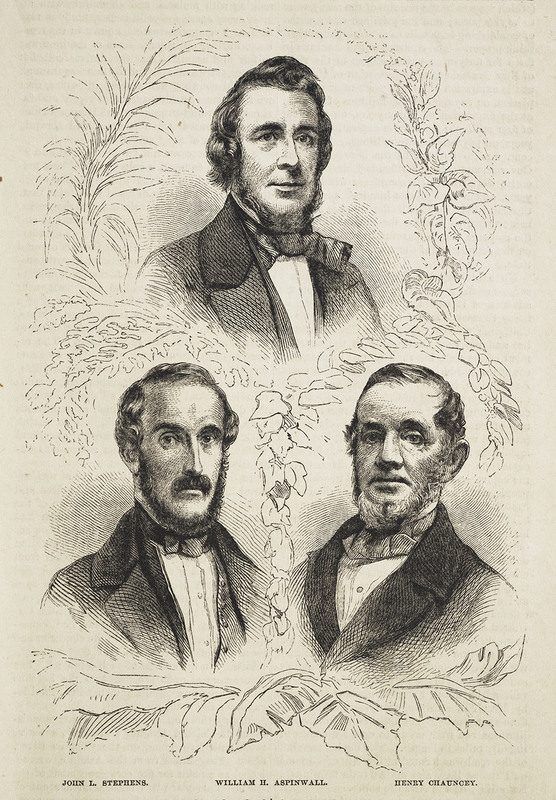 Efforts to build a railroad across the Isthmus of Panama were headed in America by John Lloyd Stephens who, in 1847, worked with two financiers, William Henry Aspinwall and Henry Chauncy, to promote the Panama Railroad Company in New York. 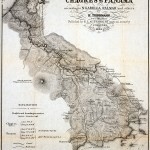 A route to cross Panama by canoe and mule path, before the railroad. From E.L. Autenrieth. A topographical map of the Isthmus of Panama. New York, 1851. Destination: California! When gold was discovered in California in 1848, the route across Panama seemed the quickest way to get there. Thousands tried it. Even before the railroad was completed, a route across the Isthmus cut weeks off the alternative journey across the Rocky Mountains or around South America. This map was part of a traveler’s guide, with practical suggestions on what to expect and how best to accomplish a journey across the Isthmus. No railroad was available in 1851, but the traveler could expect to see work on the railroad vigorously progressing. Various proposals for rail lines and a canal are shown on the map, indicating the strong demand for convenient and mechanized transport across the Isthmus. Advertisement for transportation across the Isthmus. 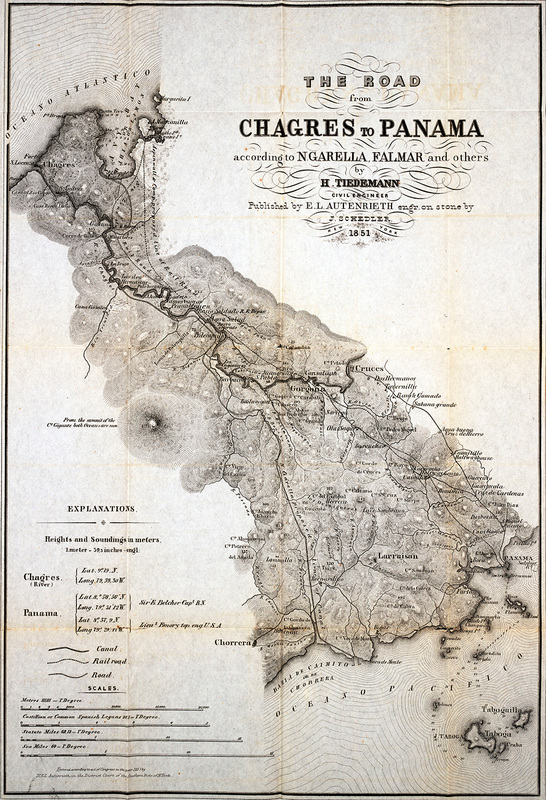 From E.L. Autenrieth, A topographical map of the Isthmus of Panama. New York, 1851. People of the eastern United States had many reasons to go to California or the west coast, or maybe just to ship packages or freight. Companies that could transport people and goods were eager to advertise their services.